Q: When will you provide me with a copy of your written informed consent? A: You will be given an informed consent in our office so the doctor can answer any questions quickly for you. Q: If an excimer laser is to be used, what size will be the optical ablation zone not including the transition zone? Is this larger or smaller than my naturally dilated pupil? A: 6.5-6.8 mm. This is larger than anyone would need, no matter what size your pupil enlarges to in dim light. If an eye doctor tells you that your pupil is too large for LASIK, walk out of his office. He does not know enough. Most treatments footprints are at least 7.8, more when astigmatism is treated. Will my vision fluctuate after eye surgery? How long is the healing period? Q: Will my vision fluctuate after eye surgery? How long is the healing period? A: Of course, you can expect some fluctuation of vision while healing. Certain factors may be the cause, mostly dryness. Q: What should I expect my vision to be like for the first few weeks after surgery? A: Depending on a number of factors, our patients usually see 20/20 the next morning. Based on our statistics we expect our patients to see better than that in a couple of days, like 20/15. Q: If an enhancement surgery is required, what will you charge for the additional procedure? A: The likelihood of needing a second LASIK will be discussed directly between you and thee surgeon on your free seminar. You will be told what the likelihood is based on our surgeons 26 years of outcomes on some 150,000 surgeries. If appropriate a warranty may be purchased. I am 48 years old. Am I old for LASIK? Age is not a factor. My oldest patient was 83, she did not want to wear glasses when she bowled. The eye simply need to be healthy. If performed by an experienced surgeon using the best no-blade LASIK, it can be surprisingly accurate. So you need the most experienced surgeon using the best no blade technique. If I have cataracts can LASIK fix this problem? Cataracts is treated with cataract surgery which is entirely different than LASIK. What could exclude me from having LASIK eye surgery? Not everyone is a candidate for lasik. The measurements of your eyes are peculiar to you. If your measurements (thickness and shape) are within normal then you may qualify. They will allow the reshaping of the cornea which is the purpose of lasik. Check if you are a LASIK candidate here or call us for a FREE LASIK consultation at 1800-EYECARE. Has anyone ever gone blind from a LASIK eye surgery or any other type of laser vision correction? 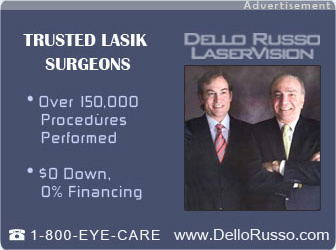 Many millions of people have had lasik. There has to be some with unfortunate results worldwide. That is why you should pick the most experienced doctor with the best and safest no-blade lasik technology.